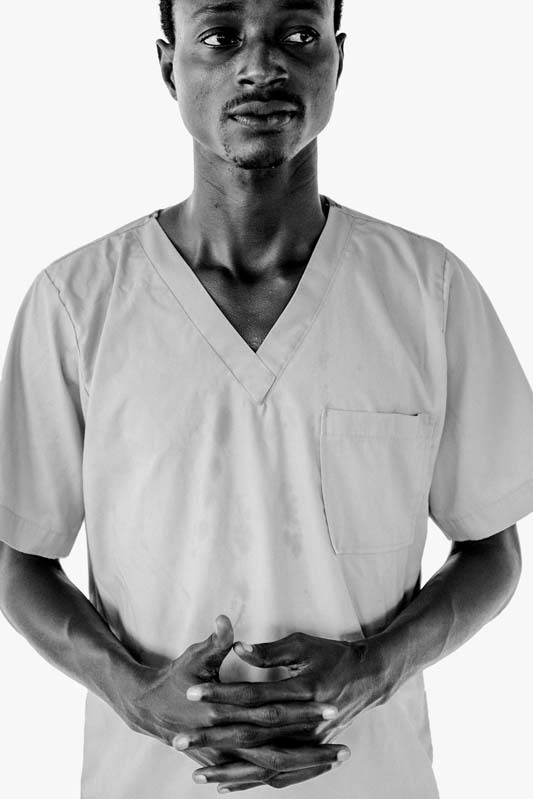 SUAKOKO, LIBERIA - OCTOBER 19, 2014: Albert Nimely, 18, from Mamba Point, Monrovia, who works as on the burial team and as a hygienist, stands for a portrait at the Bong County Ebola Treatment centre on October 19, 2014 in Bong County, Liberia. "Every day, people die of this sickness called Ebola. It hurts me a lot. Sometimes when I go in and see a patient lying there, I encourage them. I say, you have to pray, give yourself strength. Don't look up at us because we're carrying a body. You got to get it off your mind. I tell them the sickness can happen to everybody. It is not your fault." Before the outbreak, Mr. Nimely played for Liberia's U20 national soccer team. His dreams for the future include playing professional soccer internationally, working for International Medical Corps abroad and becoming an information technology specialist.